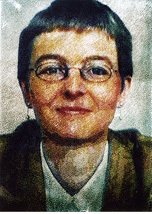 Ulrike Fischer is very active in various on-line TeX discussion groups and has written several chess-related packages. Dave Walden, interviewer: Please tell me about yourself independent of TeX. Ulrike Fischer, interviewee: I was born 1961 in Stuttgart in Germany as the oldest of three children. As child I moved with my parents first to Geneva in Switzerland (my father worked for IBM at this time) and later to Bonn in Germany. There I finished school and then studied mathematics at the University of Bonn until I got my “Diplom” (don't ask me how you say this in English). With my husband I then moved to Siegburg (a town about 20 km away from Bonn) where we lived about 20 years. Since nearly three years ago, we are living in Mönchengladbach. I'm working for a member of Parliament of the Landtag of Nordrhein-Westfalen and I hope that I can continue this work after the next election in May 2010. DW: How and when did were you first introduced to TeX et al.? UF: I didn't use TeX at the university or my thesis. I saw sometime in the second half of the 1980s in a magazine for the Atari a description of an Atari implementation of TeX together with a small introduction to LaTeX. I looked at the example (LaTeX2.09) document and knew directly I would like this and ordered the floppy disks. DW: What was it that made TeX appealing? UF: It is naturally difficult to remember what I thought such a long time ago. But I will try. I am not a programmer. At the time I had written some small programs in FORTRAN during my studies but not more. The atari was my first PC, it had a windows system and you could use the mouse and menus. Thus it may sound surprising but it wasn't the quality of the output or the capabilities of TeX/LaTeX which attracted me, but it was the interface. With interface I don't mean the GUI offered by the Atari port but the LaTeX code itself. I had written my thesis with an text processor called signum and I hadn't really enjoyed it. The LaTeX code seemed to me much more adequate and easier to use to generate text documents. I liked that the commands and the syntax looked quite natural. I knew all the names used and there didn't seem to be much “syntax overhead”, that means code pieces where I couldn't directly see the use. I see sometimes people complaining that the LaTeX syntax is not clean enough compared, for instance, to xml or ConTeXt — not suited for automatic processing, etc. But I think this people forget that LaTeX documents are mainly written and read by humans not by computers. Computers like a syntax like <h1>, <h2>, <h3> and end tags like </h1> everywhere. But humans — at least if they are not skilled programmers — prefer speaking names like \chapter and \section, and don't like to have to remember to add a specific code to end something when they think it is obvious where the end is. I liked that the commands where visible part of the document and that you could see where e.g. a list or an argument ended. This made it much more easier to insert more text at the correct place. And I liked that the commands were saved with the document. It meant that I didn't have to remember the mouse clicks and menus and keyboard shortcuts I had used to achieve a certain result (I have a really bad memory for such things). I could simply look up the commands in the document. DW: Do you remember who it was that you ordered the TeX floppy disks from? UF: No. I'm not even sure I got the dates right. Perhaps it was at the start of 90's. But I do remember it was a shareware. UF: I have used LaTeX since then for almost every document — private documents like letters but also documents at my job like press release and speeches. In the course of time I bought a lot of books — starting with the books of Kopka, but I also own the LaTeX companions (all editions), The TeXbook, a book on plain TeX, TeX Unbound, and the LaTeX manual. The Kopka book mentioned the German TeX user group, and so since then I've been a member of DANTE e.V. All the books helped me to understand TeX and LaTeX better, but I learned most when I used LaTeX, when I had to convert a theoretical knowledge in real code. In general my documents are short; I think the longest I ever wrote were the documention for my packages. But quite often I have to do a lot of similar documents. As I'm rather lazy and hate to repeat some simple tasks I always try to set up things so that I can reuse the work — even if writing all the code took more time than I gained at the end. For example, for a long time I have organized chess competitions for children and teenagers. I've had to write a lot of serial letters and name lists and naturally thought about how to use a database and LaTeX to automate the task. This led to my first article in Texnische Komödie (page 27). Later I was responsible for the bulletins of a chess competition of my chess club. This led to my various chess packages. On the whole, I think I had the good fortune to learn LaTeX at my pace and in small steps and pieces. Nowadays I see a lot of people who start to use LaTeX to write their thesis. This means they have to learn a lot of typography concepts and how to use a large number of packages and applications in a short time. And in addition they are trying to produce the quality a professional typesetter would be proud of (in a thesis which will then probably be marked by a professor who used a typewriter for his thesis). DW: How long did you use that Atari configuration? UF: I switched from the Atari to a PC with Windows 95 because we wanted access to the Internet. That must have been around 1996. I used at first emTeX, but I don't remember if I got it on disks or even then from the Internet. It was the first time that I had to use the command line and batch files and to adjust environment variables and configuration files only to install LaTeX. In retrospect I think it was quite good that I had done my first steps with LaTeX on a system where the installation was easy. Later I switched to MiKTeX, I think version 2.2. Currently I'm using MiKTeX 2.7. DW: Looking up your “various chess packages”, one finds: chessfss (chess fonts), chessboard (print chessboard), xskak (record chess positions), and enpassant (fonts from the Nørresundby Chess Club website converted to LaTeX). Do I have the purposes correct, and are there others? DW: As you started to develop packages, what did you think of the various code and interfaces you had to deal with at the programming level? They could seem considerably less logical than the document interface that first attracted you to TeX. UF: Well naturally as a mathematician I do understand the general principles in programming and don't have much of a problem to learn a language (and I know the basics of quite a lot of languages). Nevertheless, LaTeX is the only one which actually “caught” me for various reasons. First, the LaTeX kernel is rather short and — more importantly — more or less in one file. So it is easy to skim through the code and get an idea about the general structure and to find pieces of code. And while I often see people complain about the mass of packages they had to load in a document, I liked it. The fact that you add to load a package means on the other side that you can remove them to build minimal examples. This helped me a lot while I tried to understand the code. Also packages are in generally rather self-contained, complete and quite well documented. This too helps in understanding the code. I also think that the package system of LaTeX lures people into writing code. As the whole “infrastructure” is already there, you can do something new quite fast: You write some new commands to generate some list. Or you start with a package like skak, redefine some commands, try to improve the font handling, or tweak another command. And before you realize it you have written your first package. And when you look at other packages to improve your own, you can see that the various packages represent a large range of coding skills and coding styles; that packages exist in a lot of sizes; and that some are only useful for some exotic documents. That means that it is quite OK to add your own package to the lot even if it is not perfect, doesn't follow a strict guideline, and is of use only for a small number of people. After all, even if the package is bad — nobody is forced to use it. DW: You say your are lazy, but the rate at which you answer questions on the MiKTeX and XeTeX lists belies that claim. (You've answered more than one question of mine on one of these lists, and I think I first noticed your name on the comp.text.tex list.) Do you have a particular motivation for all the help you give on these lists? UF: It is fun. I like to solve problems and to find out things, and it's even better if the problems are “real” problems. But if you really look at my answers on the lists, you probably also saw that I ask quite often for minimal examples and seldom send long answers with a lot of code. Which shows that I'm lazy (and that I seldom have much time for a problem). DW: How did you get so experienced you can answer so many questions — just years of TeX use? UF: No, years of answering questions ;-). I don't have a very large pool of ready made solutions but over the years I have learned how to investigate a problem and how to find answers. DW: I wonder if you could teach your technique to others? UF: Well, I'm doing it all the time. I'm forcing people to generate minimal examples, to look at log-files, to try out code, to read documentations, to understand what they are doing. DW: A couple of more questions about your personal life, if I may. How did your career evolve from being a math student at the University of Bonn (and a TeX enthusiast on the side) to working for a member of Parliament? This seems like an uncommon progression. UF: Well no, my chief lives in Siegburg, and we knew him already for some years. The first time he became member of the Parliament was at the end of the election period. So he was searching for an assistant until the next election in eight months and asked me, and I thought it would be fun to try. And then he won at the following elections, and I'm still in the job. DW: You told me that the image you provided to go at the beginning of this interview was done by the artist Herbert Döring-Spengler. Please say another word about that image. UF: The image has not been drawn. It is a manipulated Polaroid photo. Mr. Döring-Spengler lives near Siegburg and for some years had his atelier in Siegburg. I asked him one day some years ago to make some pictures for my identification card, and at the time he made this other photo too. DW: Thank you, Ulrike, for participating in our interview series. I am sure I have not been alone in wanting to know a little bit more about the Ulrike who answers so many questions on the TeX lists and answers with such clarity and so supportively.